I've always liked different characters together especially ones that we dont know a lot about due to few appearances in webisodes and movies. They can be alternate pairings of MH characters, MH with OC's, OC's with OC's, whatever you like and feel free to add some back story!! Loved hearing about your friend group! And I love the customizations you've made, like giving Gilda eyebrows. Great job! Here are some of mine, though I apologize if I've posted any of these before. In my house, Raven and Anna like to hang out together, mainly because Anna is a great listener and lifts Raven's spirits whenever she's feeling down. And, lastly, Cerise, Holly, Ashlynn, and Blondie like to hang out because they're secretly the EAH Justice League! Thank you!! I'm obsessed with vintage spy shows like the Man from UNCLE and It Takes a Thief, so I really wanted to do something like this. I still want to put Dexter in a tuxedo and take some spy shots of him with Raven. These 2 are from different "worlds", but they're friends, and in my MH world, Flash Sentry is a freshman at MH, while Gloria Wolf (my custom ghoul from this summer) is also a freshman. She's helping him adjust...and they've become friends in the process. Awww. These are all such great shots! I don't actually have any photos, but I do have headcanons! 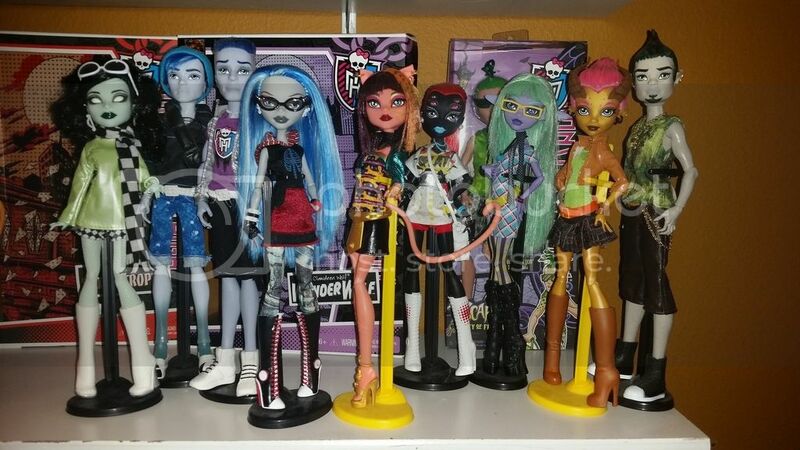 In my group, the little sisters (Lorna, Mouscedes and now Howleen) are all friends. 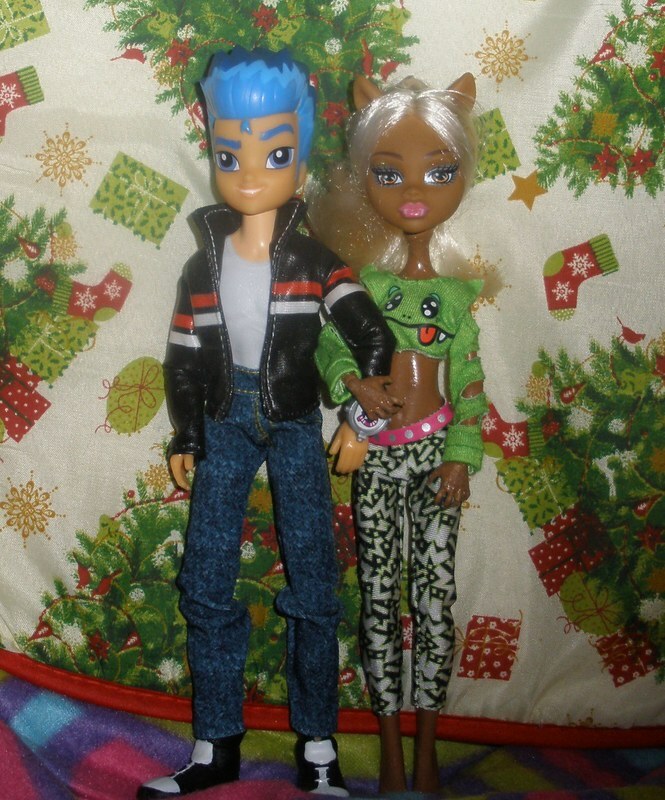 Howleen is also friends with Finnegan because they were bought together, lol. Surprisingly, Garrott and Porter are friends because Porter likes to use him as a canvas and Garrott doesn't mind (it's kind of like the relationship between a trusted tattoo artist and someone who loves tattoos). Gilda likes fanging out with Venus and Honey, Robecca and Elle are BFFs, and Rochelle often tags along. The three werecats also like to fang out together (though Catrine and Catty only really invite Toralei because they feel sorry for her). Naturally, Draculaura and Elissabat are inseparable. Gigi is friends with Jinafire and Casta. Also, the water monsters are all friends, as are the ghosts: so Lorna spends time with Lagoona, Gil, Sirena, Finnegan and Vandala, while Sirena spends time with Kiyomi, Vandala and Porter. Of course, I headcanon that my dolls live in this huge converted hotel together, so they're all friends. These are my Bad Kitties. Sometimes naughty, sometimes nice. OOOOH love this! Maddie in Love in Scaris Rochelle's outfit is ADORBS! I really need to take more photos, but I also have a few headcanons. Catrine, Rochelle, and Viperine are friends since they're all from the same parts of Europe (France/Spain), and Catty's in there as well because I've paired her with Catrine. Viperine also is friends with Skelita because they can both speak the same language, and Skelita lets Viperine practice more elaborate makeup on her with her sugar skull look. Also since the whole BYBY storyline, Mouscedes will keep in touch with Catty (As well as some of the other ghouls from MH), and will hang out with them as well from time to time. Ooooh I love Apple and Jake, Oberon! 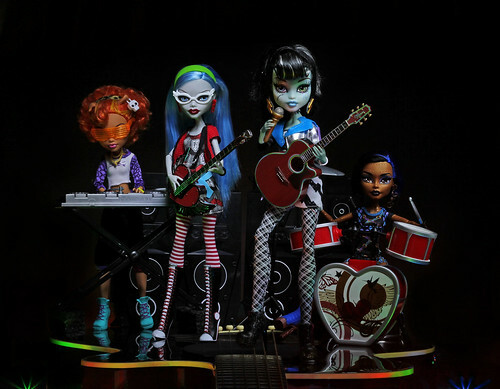 I love that you made Viperine and Skelita friends your story about the make-up is super cute! Their band is called 'The Boo', and they each have a stage name. Frankie is "Dr. Franko". She plays guitar and sings lead vocals. 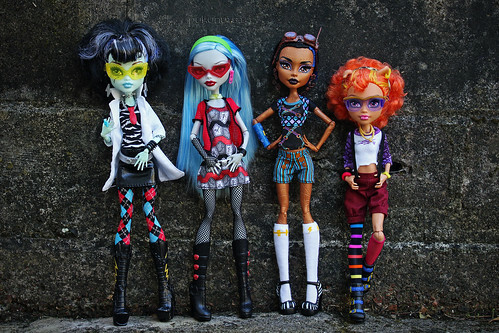 Ghoulia is "The Ghoul". She plays bass and does backing vocals. Robecca is "Robotica". She plays drums and does backing vocals. Howleen is "DJ Howlin' Wolf". She plays the keyboards and does samples and such. Pukunui, that is TOO awesome! LOVE Scarah with the repainted lips! Oh, and flocked Wydowna is lovely too! Pukunui thats so cool!!!!! 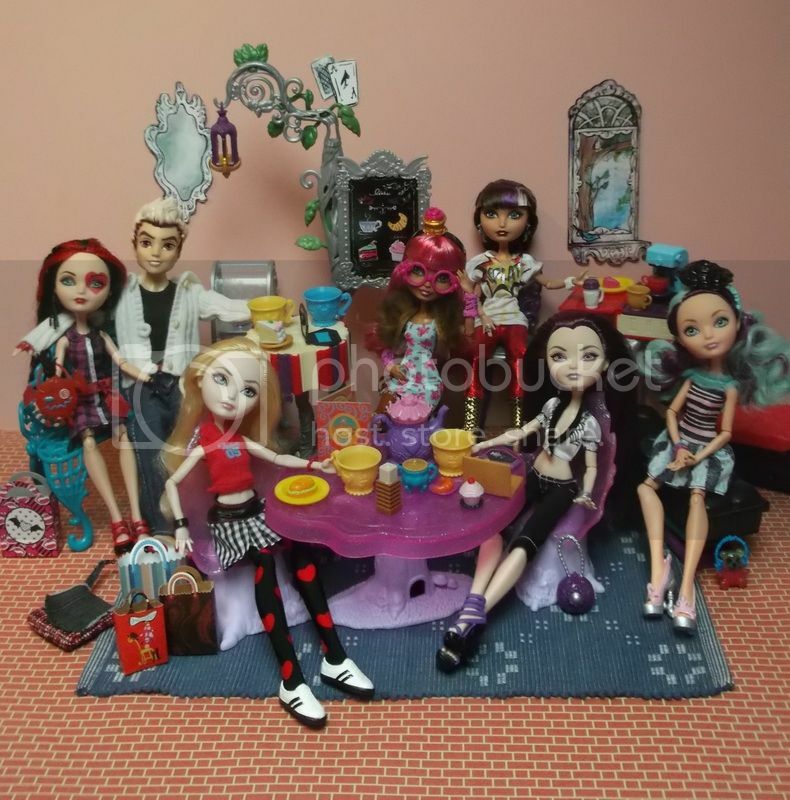 I especially love Howleen and Frankie, they're gorgeous! !